This was the first leaflet from the Dublin Anarchist Group, and below is a sneering and very inaccurate report from a Stalinist journal of the time. The DAG only lasted for a year or so before it had a friendly split. The minority got together with some likeminded people from the Belfast Anarchist Collective and formed the Anarchist Workers Alliance. That can be seen as a forerunner of the Workers Solidarity Movement (formed in 1984). 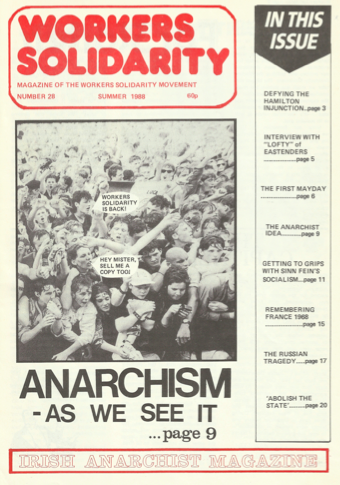 The majority, who favoured a looser and less politically defined group, went on to establish the ABC bookshop in Marlborough Street and published two issues of a magazine called Resistance. Proving that Dublin is a small place, they shared that building with the Socialist Labour Party and the 32 County Feminist Federation. 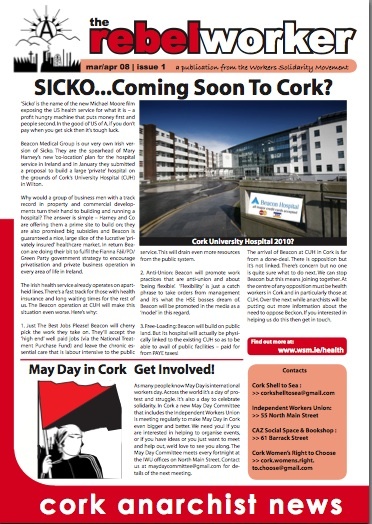 This snippet comes from superSPI, the often humourous magazine of the Socialist Party of Ireland. This had no connection to today’s party of the same name. It was a small hardline Stalinist split from from the Official Republican Movement in 1971, which sought to win the Moscow franchise away from the Communist Party. Over its 11 years of life it never spread beyond Dublin and the remnants ended up in the Labour Party. Getting three things wrong in just two sentences wasn’t bad going! 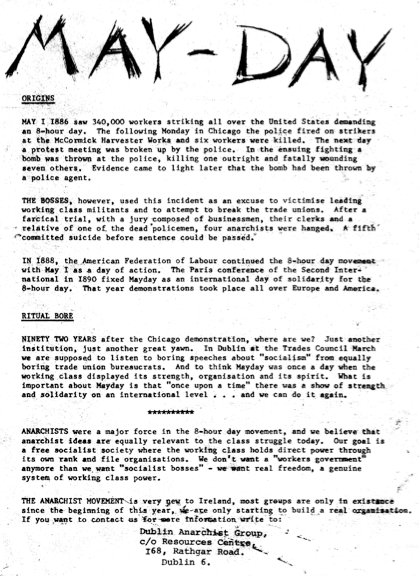 The leaflet was not distributed in Trinity College but on that year’s Dublin May Day march. 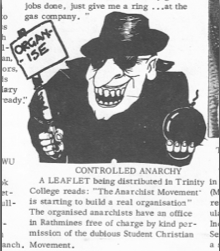 The Dublin Anarchist Group didn’t have an office in Rathmines, and not having an office it couldn’t have been courtesy of the Student Christian Movement. The real story was far less interesting. 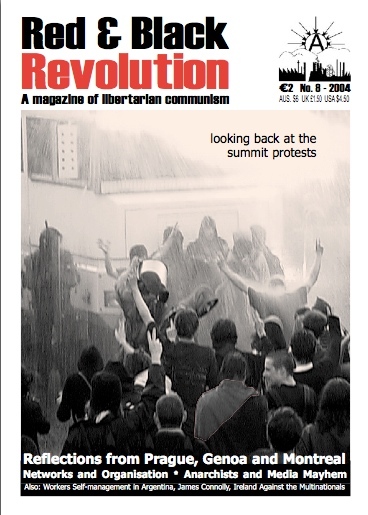 The Dublin Anarchist Group had been formed a couple of months previously. The Student Christian Movement allowed a multitude of campaign groups to use their address for mail, and the DAG asked if they could also use it for a few weeks until they sorted out their own. I don’t think there were any Trinity students involved (though I could be wrong), though there was a WUI shop steward from Trinity. There were a couple of students from UCD but a good few of the 25 or so members of the group were ex-republicans (both provo and sticky) or union activists. I can remember people from the CIE works in Inchicore, Dublin County Council, and Ardmore Film Studios. And whilst talking of ‘interesting’ things, the SPI who covered Ballymun and Tallaght with anti-Provo “Isolate the Gunmen’ posters, had originally funded themselves by an armed raid on Ballymun post office.